Men…put this on your calendar! 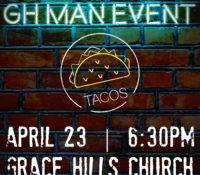 The next Man Event is Tuesday, April 23 @ 6:30pm at Grace Hills Church. We are going to have a panel discussion on a very important subject: “How Do I Tell My Story About Christ?” So grab a friend to bring with you for an informative evening. Oh, we will also have a TACO Bar…come hungry!